Pudding is one of the favorite dessert of young and old. Besides delicious soft texture caressing tongue. Try the following recipe pudding. Combination legit milk, creamy coconut milk and fragrant strawberry pudding made even more special. Good luck. 1. Mix the powder to the fresh liquid milk and coconut milk, stir well. Boil, until boiling. Add sugar and vanilla paste and stir well. Bring to a boil again. Lift. 2. For the dough into two parts. Add pasta strawberries in one part and let the white on the other part. 3. Prepare a serving glass or cetakkan pudding. 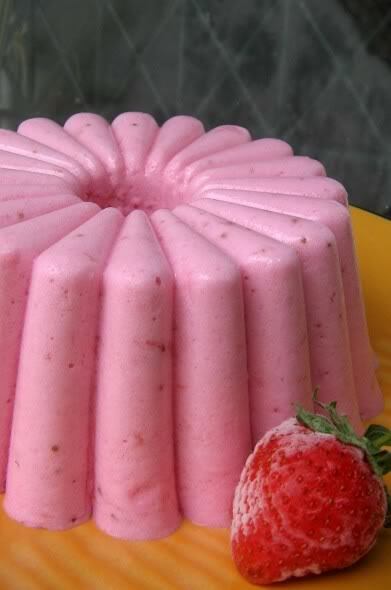 Give a few pieces of strawberry, red batter to pour more than half the height glass / Mold. Refrigerate until hardened. 4. Pour white batter until the cup is full, chill again. Serve cold.